Six months ago this blog presented the very rare first edition of Marie-Catherine d’Aulnoy’s Les Contes des fées, of which a complete set (including engraved frontispieces in volumes 1 and 3) is preserved at the Württembergische Landesbibliothek in Stuttgart, Germany. This first collection of d’Aulnoy’s fairy tales was followed in 1698 by four more volumes, entitled Contes nouveaux ou les Fées à la mode (New Tales or The Fashionable Fairies). This sequel has become just as scarce as the inaugural Contes des fées. The French national library (BnF) owns the first two volumes, which can be consulted online in digitized form. The BnF copy is not only incomplete but also imperfect: Volume 1 is lacking its frontispiece, while the prefatory Epistre in verse, due to a binder’s error, appears at the beginning of Volume 2. Single volumes can be located in Neuchâtel (vol. 1, with the Epistre), Laon (vol. 2), and Budapest (vol. 2). Volume 3 was known only from a copy belonging to the 18th-century scholar and Sorbonne professor François Moureau; this copy does not have a frontispiece. Volume 4 was completely unavailable to recent editors, who established the text by working from a 1711 reprint. If the Contes des Fées of Madame Aulnoy have had a remarkable vogue, not so fortunate has been the lot of some of the historical endeavors of this lady. […] she describes her voyage into Spain with a brilliancy and wealth of detail which is all the more grateful in that the period has furnished us with but little like it. In this Journey she has produced a remarkable book. It is not known when and where Archer Huntington acquired his copy of d’Aulnoy’s Contes nouveaux. It probably came from the collection of his mentor, Yale professor William I. Knapp, most of whose books passed on to Huntington. Three of the volumes are signed or stamped by earlier owners: “Jacques Carbon” (vol. 2); “Bibliotheca Adr. Maillart Adv. Paris 1741” (vol. 3); “Marie Marthe Olimart” (vol. 4). These different provenances suggest that the set was patiently assembled by a 19th-century dealer or collector because a “better” copy was impossible to find. The 1898 auction of the library of the French bibliophile baron Jérôme Pichon included a set with similar characteristics (no. 3508: “exemplaire fatigué; reliures non uniformes”), but the description is not detailed enough to provide any certainty. In this programmatic image, an old woman with glasses and a turban (reminiscent of the Cumaean Sibyl in the Sistine Chapel) reads a large book before a pair of children, while another child (or putto?) is playing with a monkey. The open book displays the running title “Contes des fées”; the rest of the text is not legible. First analyzed 25 years ago in a seminal article by Gabrielle Verdier,1 this frontispiece has often been reproduced and commented, but always on the basis of the 1711 edition, in which it appears at the beginning of Volume 3, entitled Suite des Contes nouveaux. The date of its first publication had remained uncertain: while Verdier argued that it must have already been part of the first edition, other critics have speculated that it was created later, as a posthumous homage to d’Aulnoy (who died in 1705). The New York copy settles this debate and confirms that the frontispiece indeed appeared in 1698 – and with the first volume, not the third. This image offers yet another scene of female storytelling, and surely the most intimate and graceful one. The teller/”fairy” here is not a hag, nurse, or sibyl, but a young, elegantly dressed woman surrounded by four children. Her winding wool into a ball evokes the spinning traditionally associated with popular storytelling, an association reinforced by the etymological proximity between fairies and the Fates. The infant in the cradle may be a variation on the iconographic motif of the sleeping Jesus watched over by the Virgin Mary and John the Baptist, as in Michelangelo’s “Madonna del Silenzio.” Like the first frontispiece (where the woman’s mouth is clearly closed), the image appears to suggest both speech and silence, perhaps in an attempt to instill in the reader an attitude of attention and a sense of mystery. Both these frontispieces, as well as all the half-page vignettes in the four volumes of Contes nouveaux, are signed “Raymond [or: Raimond] Fecit [or: f.t].” This seems to refer to the little-known engraver Jean Raymond, who also illustrated a 1703 edition of Aesop’s fables (using the signature “I Raymond fecit”); in his later career he produced a number of large-scale reproductive prints, and died in 1736. Raymond’s style is markedly more delicate and sophisticated than that of Antoine Clouzier, who signed the illustrations for volumes 3 and 4 of Les Contes des fées. 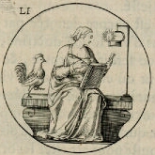 The change of engravers was linked to a change of publishers: whereas Les Contes des fées appeared with Claude Barbin, who had published all of d’Aulnoy’s books in the 1690s (except the first), she gave her Contes nouveaux to Catherine Legras, widow of the bookseller Théodore Girard. In June 1698, Girard and Legras’ former apprentice Nicolas Gosselin took over the shop: the Hispanic Society’s copy of Volume 2 already shows his name on the title page, whereas the BnF copy still says “chez la Veuve de Théodore Girard.” Volumes 3 and 4, the printing of which was completed in July 1698, were published under the imprint of Gosselin. I am inclined to believe that d’Aulnoy’s move away from her longtime publisher Barbin had something to do with the question of illustration. The work of Raymond is certainly superior to that of Clouzier, and more in sync with the author’s literary art and outlook. The frontispiece to Volume 1 of Contes nouveaux can be seen as a revision of that to Volume 1 of Les Contes des fées (both featuring an old woman with a book); likewise, the gentler, maternal images that introduce the respective third volumes appear to mirror each other. While many aspects of the publication history of d’Aulnoy’s eight volumes of Contes remain mysterious, the copies mercifully preserved in Stuttgart and New York provide a wealth of new textual and visual material and call for closer inspection. 1. Gabrielle Verdier, “Figures de la conteuse dans les contes de fées féminins,” XVIIe siècle 45, 3, July-September 1993, p. 481-499. This entry was posted on October 17, 2018 by VS in Book Illustration, Printed Books and tagged Editions, Fairies, frontispieces, Tales. Anecdota | © 2019 The Trustees of Princeton University. This blog is licensed under a CC Attribution Non-Commercial License.